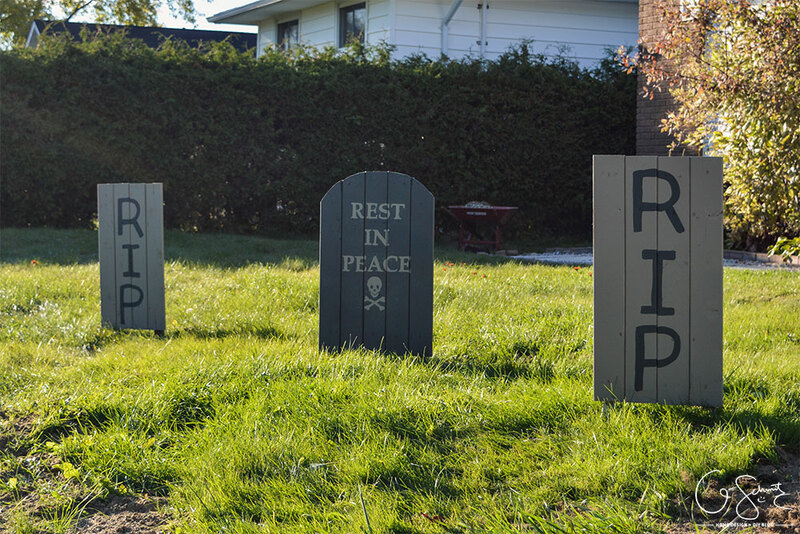 Looking for outdoor Halloween décor ideas to start planning your decorations this year? I’ve rounded up over 20 different ideas for you today! 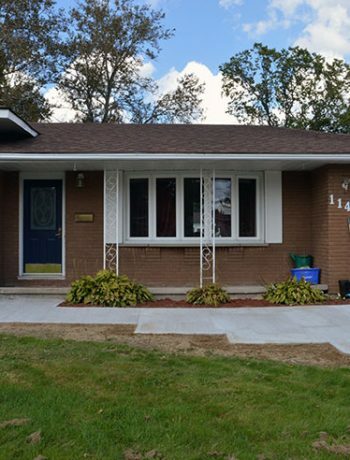 I’ve rounded up over 20 different ideas, and I’ll be splitting them in a few sections: focusing on front doors/entries, planter specific décor, porch/patio ideas and finally larger/yard projects. Let’s dive in shall we!? (Just a note, if you want to save any of these ideas to Pinterest, you’ll need to visit the links and pin from the original sites). 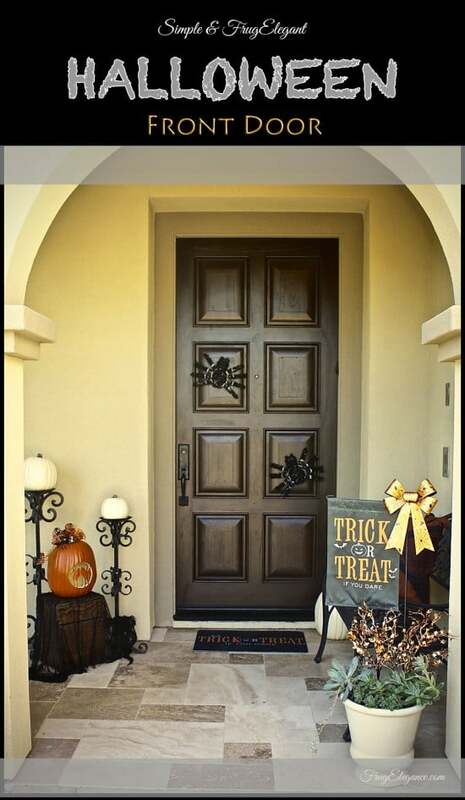 What says “Trick or Treat” better than a decorated front door and entryway? 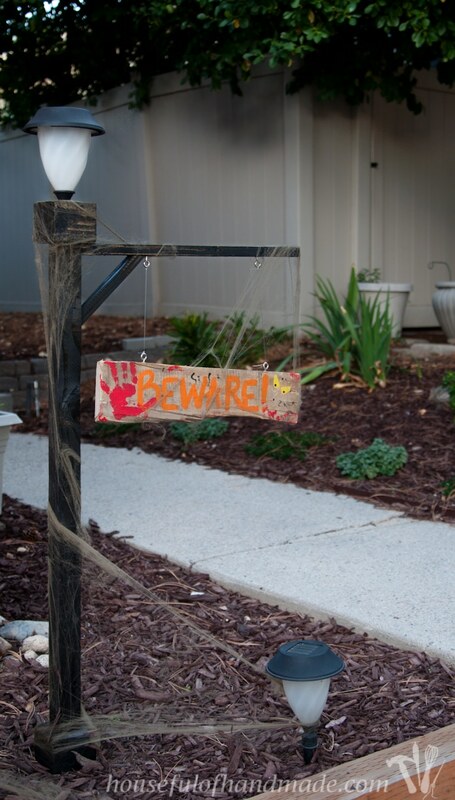 The front door from FrugElegance is complete with a Halloween doormat, spider décor, pumpkins and more! 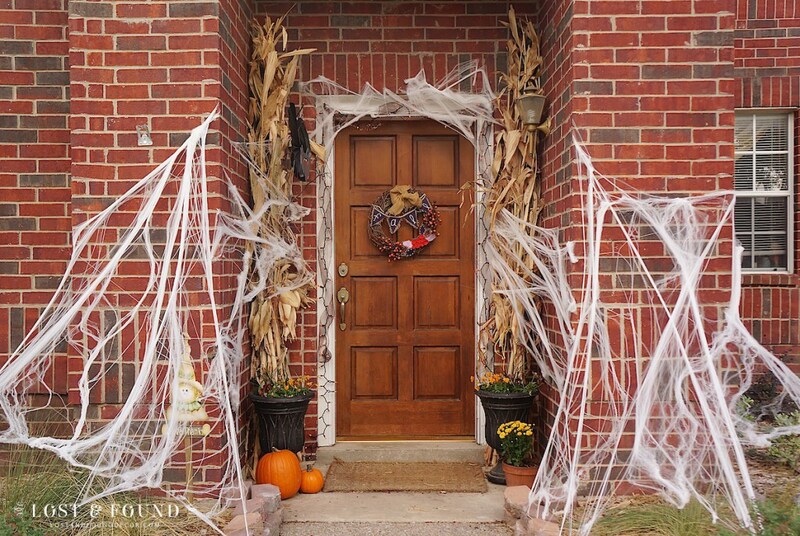 Melanie at Lost and Found Décor surrounded her fall-themed entryway with spiderwebs. 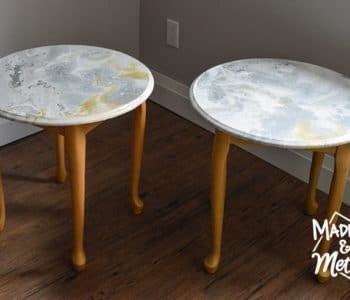 If you have a glass (or mostly glass door) you can create a vinyl silhouette just like Jessi from Practically Functional did. 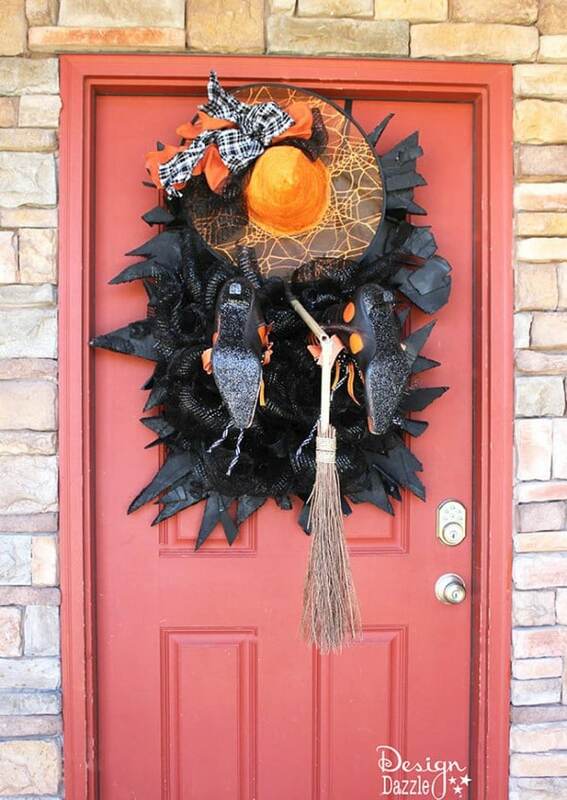 What about making a spooky witch wreath? See the full tutorial at Practically Functional. 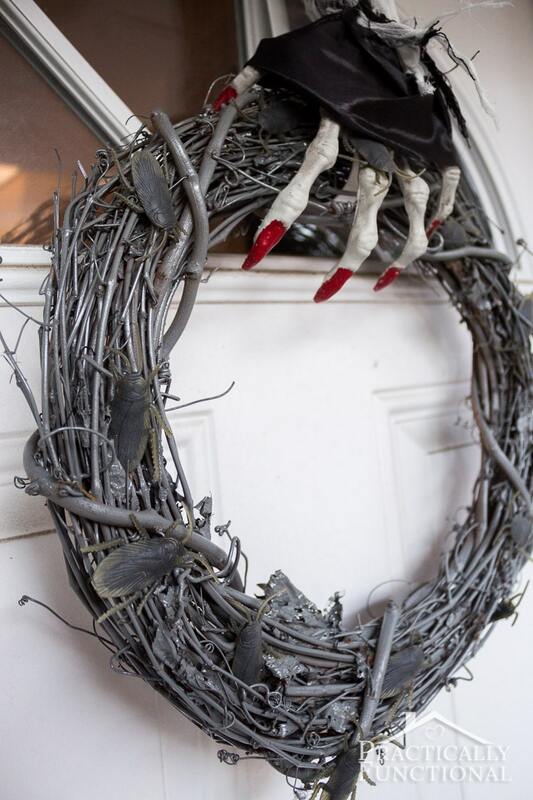 Speaking of witch wreaths, check out this crashing witch idea from Toni at Design Dazzle. Prefer spiderweb décor? Check out this spider wreath from Houseful of Handmade; and this spiderweb frame from Twelve on Main – which can be hung on the wall as well. 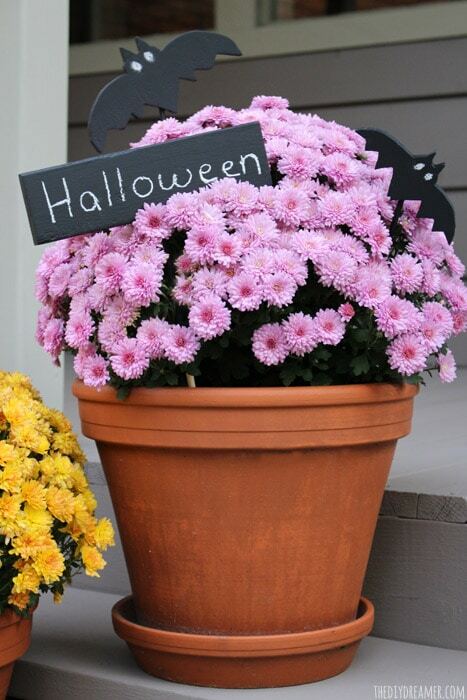 Whether your planter holds seasonal mums/flowers or is empty (like mine was last year) – they still present a great opportunity to be decorated for Halloween! 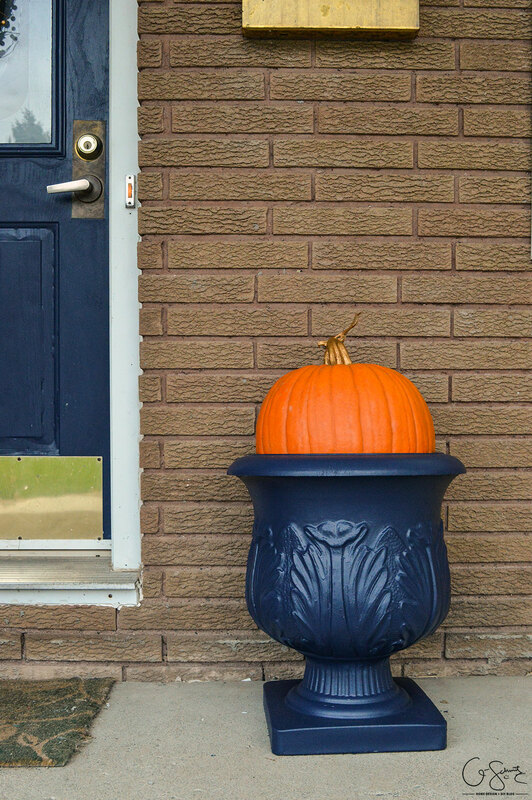 Like I mentioned, last year I had an empty planter than I had painted dark blue to match my front door. I simply plopped a pumpkin inside and it was probably the easiest + quickest idea ever haha! However, if your planters are already filled with flowers, why not add some DIY bats or mini signs like Christine from the DIY Dreamer? Or you can make some wicked witch legs like Medina from Grillo Designs and plop them inside (or in a nearby bush!). Don’t have a planter? 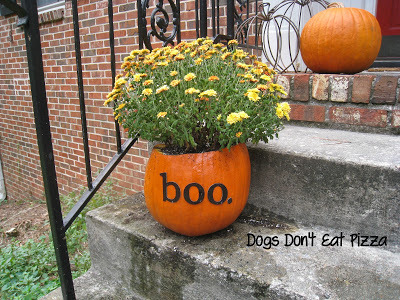 No problem, Karen from Dogs Don’t Eat Pizza has you covered with a great tutorial on making pumpkin planters. These ideas are great if you have a front porch to decorate! 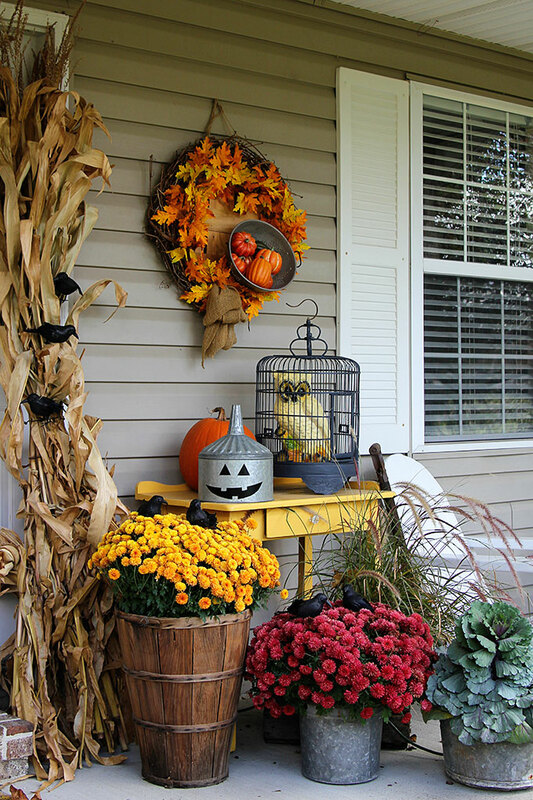 For example, if you already decorate your front porch for fall – just add a few transition pieces to make it more Halloween themed. See House of Hawthornes for ideas and inspiration. 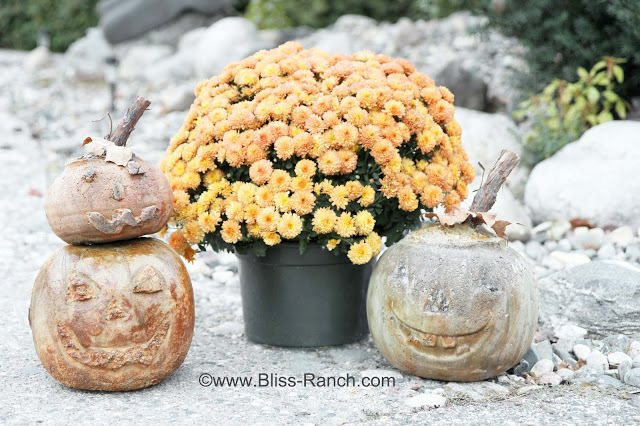 You can add your own DIY concrete pumpkins too, just like these from Bliss Ranch. Or make a corn husk witches broom like Sara from Twelve on Main. 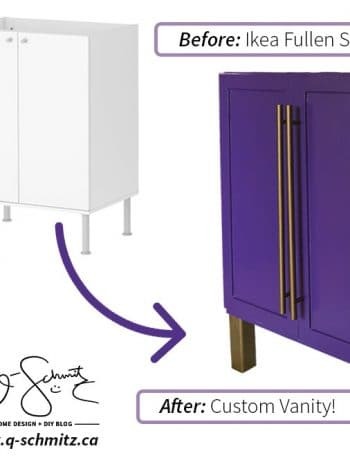 Have an old hutch or other wood hanging around? Make a custom sign like Carrie at 38th Street. 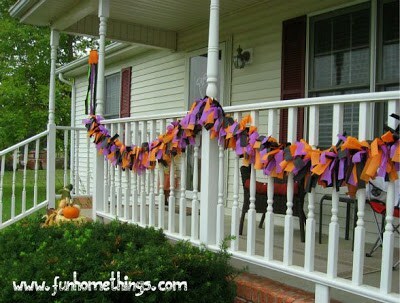 If you have a fence or railing along your porch, you can add a DIY garland made with tissue paper. 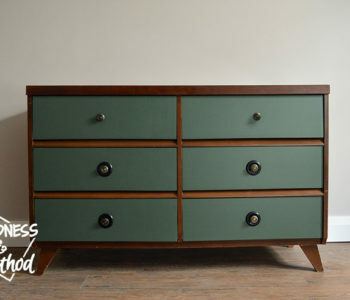 Katie at Fun Home Things has a full tutorial. Check out these great luminaries you can add to your front porch. Flourish and Knot has all the details, and bonus – you can even use them inside! 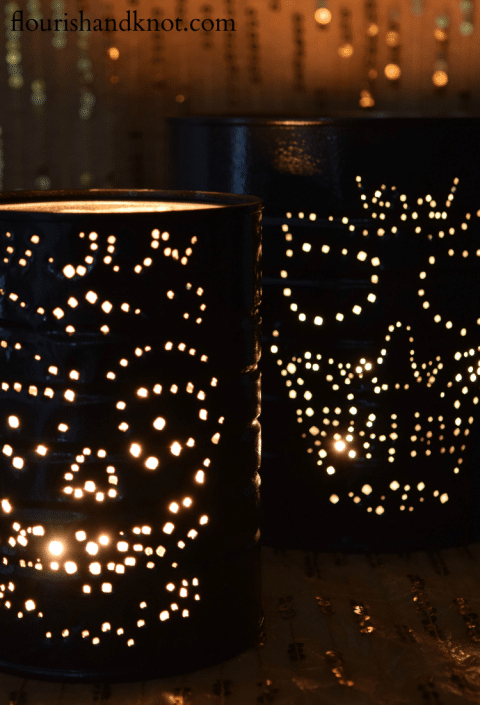 Last year I made much simpler luminaries and used them in my Halloween décor too! Now these projects are for those of us who may have a bit more space, but some of the ideas can certainly be used for the front porch or smaller areas as well. 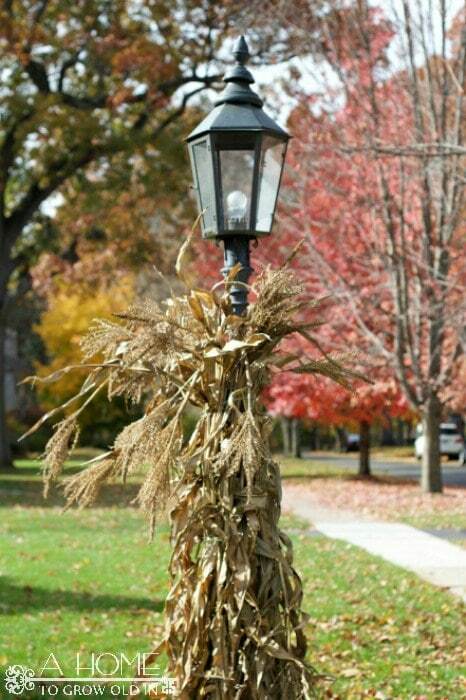 If you have a lamp post in your yard, you can easily add some corn husks around it for instant Fall flare! Robin from A Home to Grow Old In has this and more décor ideas too. Or, if you don’t have a lamp post – you can make your own following the tutorial from Houseful of Handmade! 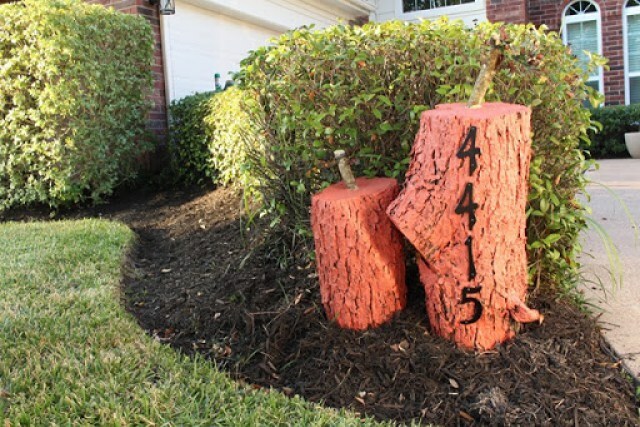 Have some old tree stumps around? Paint them pumpkin-orange like Lura from Domestic Ability. (Check out those super cute bats on the garage door too!). These adorable “floating” ghosts from Practically Functional would be perfect for a big front yard. (Spoiler: I’m planning on doing something similar). 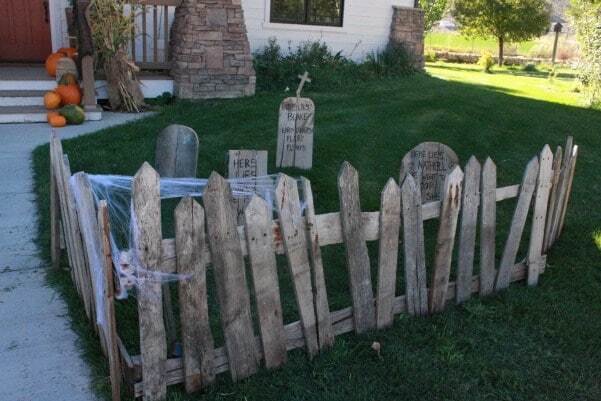 If you’re a pallet hoarder, you can build your own spooky graveyard complete with tombstones and a picket fence like the one at Twelve on Main. Great roundup! 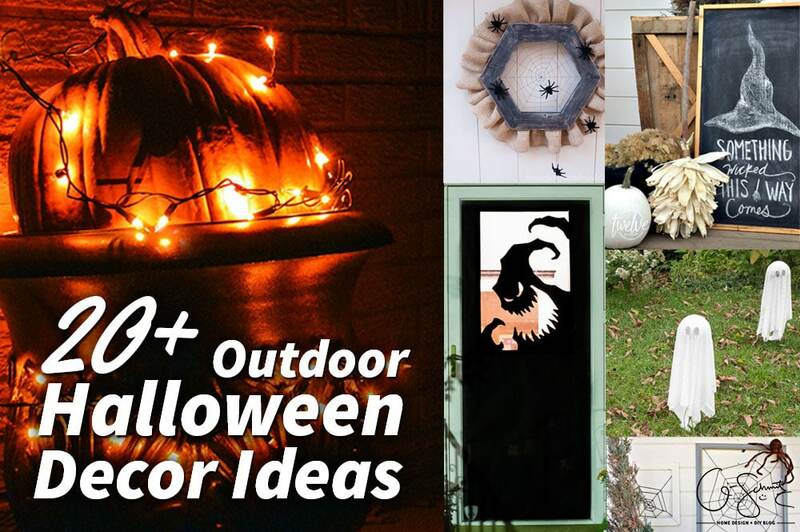 Thank you for including my pumpkin planters! What a good idea to combine two different fall/Halloween things into one! Right? There are so many good ideas, I may have to use some as well! So much fun your outdoor space, its festive and your kids will have a ball. There were definitely some great ideas! What a great way to use up some old stockings and shoes too! These are all great ones! I really like the glowing lanterns, perfect for Halloween night! You definitely need something to lighten up your entrance way too, so it’s a win-win! Great ideas, Nicole! Halloween is a fav around here also. I love all the Halloween decor! 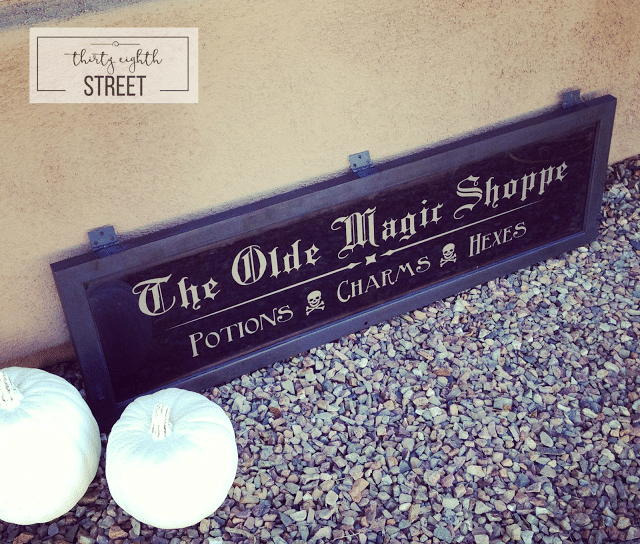 Halloween is one of our favorite holidays so we are always on the hunt for great decor! Pinning! I like that you can choose to decorate on the spookier side, or even more neutral “fall” themed! I think I need that pallet fence! So fun for halloween. Thanks for including my lamppost in this fun roundup. Pinned! 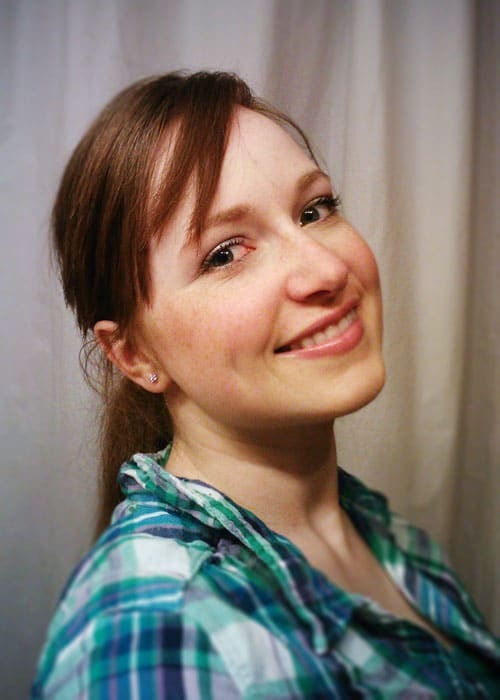 It was so much fun reading through this post! 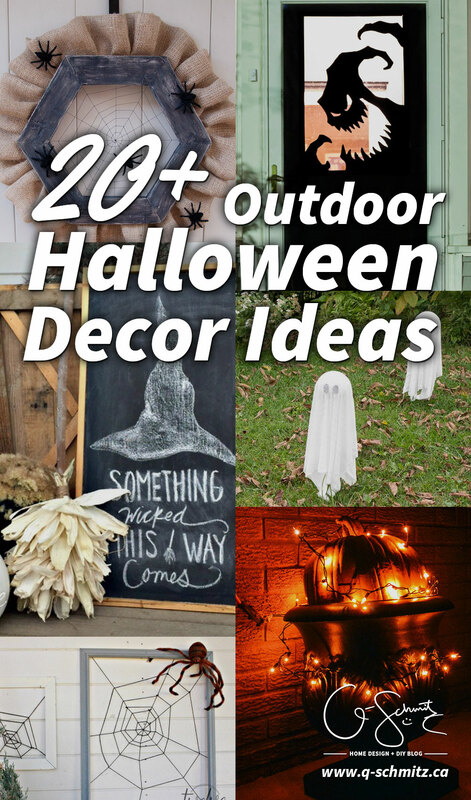 So many creative Halloween ideas – pinning! 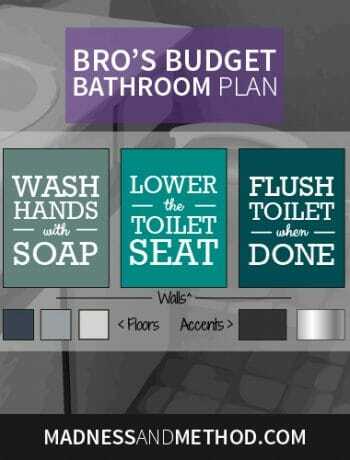 There are some that are genius AND super easy to do! This is an AWESOME round up!!! That wreath with the skeleton hand? GET Out!!!! I gotta make one ASAP!!! So many creative ideas right! ?